Oh boy, I've done it now. I've finally received my fog lights from Banggood, and they are... Something. The box says "I line my cool my wonderful", so you know my hopes for a quality product with clear instructions are high. The product description on Banggood says 3-mode; high, low and strobe. Since there are only 2 wires (red/black), I can only hope there's really only 1 mode. Otherwise I'll have to include a momentary switch in the circuit to cycle modes. Hope you have a "Bang Good" time with them. The most high tech thing in those is the RFID scanner that sends your CC info to China! Lots of trash on that site, but lots of good stuff, too. If these don't work out, I'll try the ones for Harley next. They look pretty cool, and are likely not knockoffs. If you’re just a bit handy Google how to remove strobe and low mode from cree u5 lights. I can probably handle that. What I'd really like is to enable active switching of the 3 modes. Strobe would be extremely useful for lane splitting, and low/high switching would also be convenient. Cycling through modes with a momentary switch, however... Not so much so. 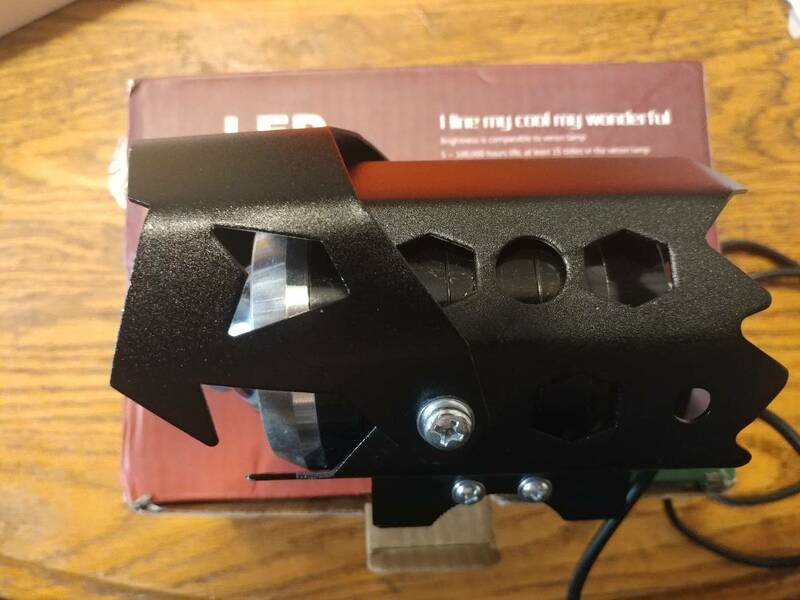 I can add something about the reason alot of chinese LED are rated 12v to 80v DC.Its for the variety of electric bicycles and scooters,of which China is surely the world leader.I buy these type of lights for my ebike, its an all encompassing system for many different vehicles. The higher the volts in your battery pack,the more power to your drive-train.The battery systems are configured by series-parallel combinations for power and capacity. For example,the trusty old golf carts were 36v,maybe more now.I have a 48v battery on my ebike,next battery I could go bigger.When you crank my throttle,you can release up to 1000 watts power in my system,compared to a human who can pedal maybe 100 watts continuous. Battery volt systems on ebikes now are getting higher and higher for power as the tech progresses,like that needed to climb steep hills like an enduro 250cc! Here in N. america,they want you to buy their specialized ,volt specific rated ebike lights for 10 times the price.. Mysterious stuff so trust them. On my ebike,I run a 5 watt tailight and 18 watt headlight (their rating, i forgot the lumens),both 12v to 80v. Couldnt find bright ebike lights like this here anyways. Works great ,2 years now despite all the vibration as I like to ride off road.My on board real time system analyzer says they are only drawing 2 watts from the battery.Those LED draw little power,its hard to figure out all the different ways that LED are rated world wide!But my system analyzer doesn't lie about the actual real time power used from the battery and they're motorcycle style brightness,the brightest bicycle lights you can imagine. Probably illegal on a bicycle here.Only drawback,water resistant but not waterproof,no O rings.Total cost....$20 free shipping.. Yes, never crossed my mind, all kinds of e bikes in my neighborhood . You are correct, many advantages to going higher VDC, unfortunately the 12 VDC is more or less a dinosaur and will never change. Much like battery operated tools, the VDC is becoming greater, which means the total wattage per same gauge wire increases.Thanks for posting. Probably illegal to run strobe. These "flashlight" style strobes you would be popped by CHP in a second. You can under federal law run a modulating headlight, singular (can be low or high beam). And has to function at a specific cycles per second, along with meeting wiring guidelines to make sure the light still works if the modulator fails. CHP got properly smacked for trying to say modulators are illegal. I'm fairly confident I can do just about anything I want with a flashing white light visible only in the front during daylight hours as a result. It was a fairly amusing fight to spectate, as I recall. The lights still basically work, but one is now considerably brighter than the other, or the beam pattern is diffused in such a way to make it appear less bright. Oh, and anyone in front of me at night hates me. I'm thinking of trying the Harley fog/driving lights from the same source later. The set will cost around $95 as opposed to [email protected]$17ea, but that's still not bad compared to a set of Denali's. Before you buy anything else look at these. And if you have an AutoZone close to you they should have them in stock. These are strobes that you can adjust. I've tried them in the store and there is NOT a setting to just keep them on. You can slow the strobe down but it will always flash. Not sure if this is illegal to have but these lights are small enough to be mounted in other areas. I was thinking if I got these I'd probably try them under the front cowl, pointing down. These you can also try in the store. They're small and cheap but rather bright! They were able to shine all the way down the aisle and in daylight! Last edited by 52Degrees; Today at 10:07 AM.